The massive majority of marketers aren’t psychologists. But many popular marketers regularly employ various psychological sales techniques when attracting customers. Clever marketers use psychology to attract as well as engage clients, and force them to buy. It’s getting more and more difficult to convert cold website visitors into leads and even more into paying customers. Well, there’s no surprise considering that currently there are over 650,000 revenue generating ($1k annually) online stores in the world. The competition is just massive! But the problem is that many online companies are paying little attention to their customers buying habits and psychological factors. In today’s post, I’m going to show you some psychological online sales techniques you can get ideas from and to test out on your own business. Seller and buyer relationships have some very interesting traits. Usually, when sellers are trying to sell something online, they’re overloading their websites with information and various action options hoping that it’ll help increase their sales. Because customers make a decision to buy faster when they’re able to focus on the product without any additional distractions. 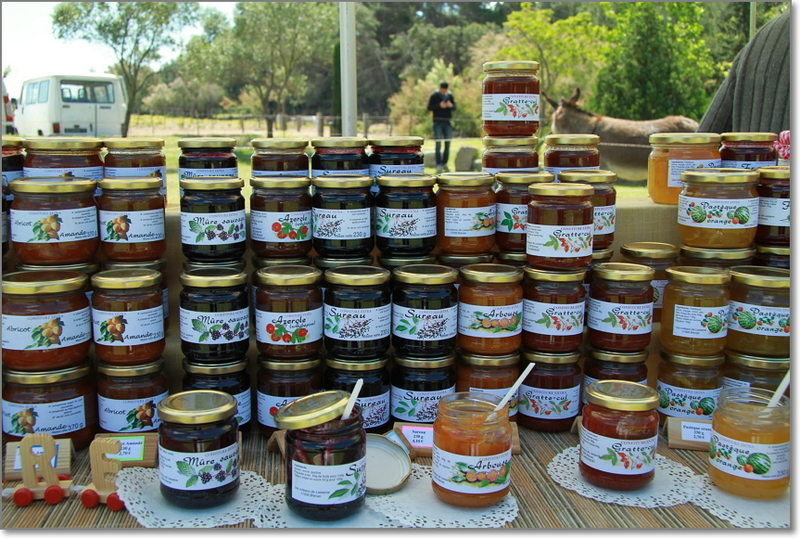 and even… fewer products to choose from! Don’t let your potential buyers think about anything other than the product you want to sell them. The more visual inputs and action options your visitors have to process, the less likely they are to make a purchase decision. This is because instead of letting your potential customers to focus on what you want them to do, their attention is pulled every which way causing them to actually miss out on the action you want them to take. So to avoid this, you need to find out which distraction are the most harmful to you and how to fix them. When browsing the internet, we become very lazy and capricious people. And this particularly occurs when we have to complete various long forms in order to get or buy something. Which registration form are you more likely to complete? I have no doubt that you have chosen the second one. The problem is that we’re just too impatient for those time-consuming tasks… And if we’re uncertain whether we really need that product, we are more likely to close the browser window than complete those massive registration forms. And various online studies confirm just that. For example, Marketo conducted A/B testing on its registration form to find the best performing version. The company tested forms with five, seven and nine fields. 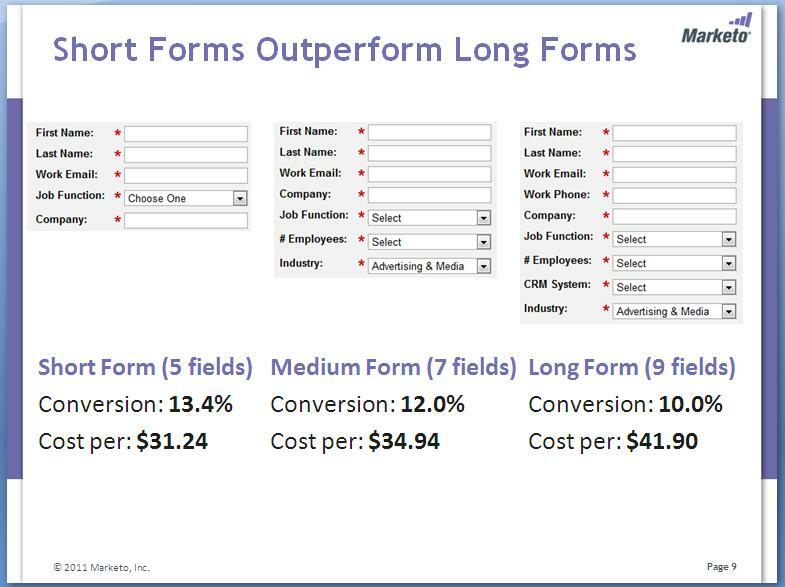 The short form with only five fields produced an average conversion of 13.4%, with a cost-per-lead of $31.24. Adding additional company information fields — number of employees and industry — to the form, dropped conversion to 12% and raised the cost-per-lead to $34.94. Adding the CRM system and work phone fields further lowered conversion to 10% and cost-per-lead jumped to $41.90. As you can see from the table above, an additional 4 fields decreased conversion rates by a whole 34%! That is a very measurable number. And can you even imagine how much lost revenue that one additional field could cost for such a large company like Marketo. If your users need to complete the registration, only ask the most important information. The best solution would be to let them create an account only by providing their name and email address (this way, you’ll gather their contact information) and ask them to provide additional information in later steps. Distractions on Your Landing Page Can Cost You a Lot of Sales! 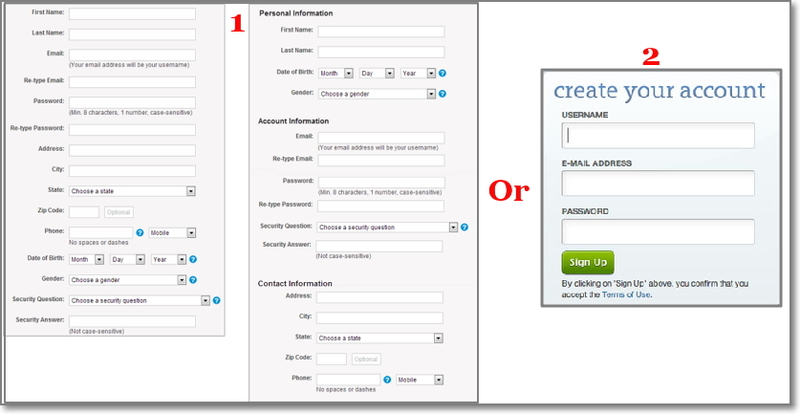 The rule with fewer choices works not only with registration forms but with landing pages too. Here’s an example from Visual Website Optimizer showing how one of their certified partners increased revenue by reducing choices on their client landing page. The objective here was to modify the homepage/landing page in order to draw more visitors into the sales funnel by minimizing the number of distractions. So, they’ve created a new landing page variation which only had one call-to-action button and significantly reduced the number of links. As you can see, the original homepage confronted visitors with too many choices, which causes confusion. Reducing distractions resulted not only in a bounce rate decrease but also had a positive impact on the conversions and total revenue. What to do with my landing pages? Don’t overload your visitors with information. Make your landing pages as simple as possible – remove all the distractions and leave only the most important information with a highly visible “Call-to-Action” button to encourage your visitors to take the desired action. You probably think that the more products you sell – the more revenue you’ll earn? 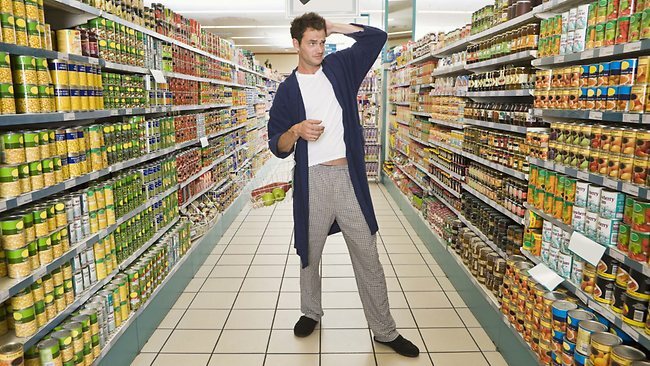 When there are too many choices, people are less likely to buy something. Sheena S. Iyengar, a professor at Columbia University and Mark R. Lepper, a professor at Standford University carried out a test to find out how different quantities of products affects buying behavior. They set up a free tasting booth, with six different jams in a grocery store. 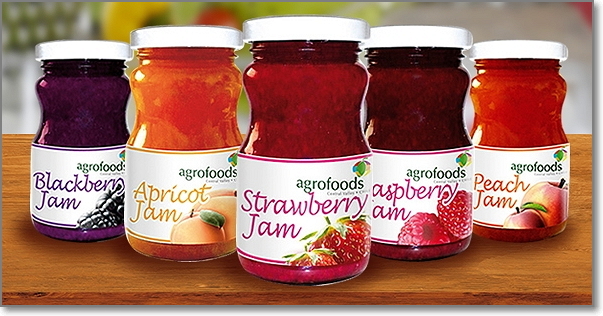 During the test, 40% of the customers stopped to taste the jam and 30% of those bought some. Then a week later, they set up the same booth in the same store, but this time with twenty-four different jams. 60% of customers stopped to taste. But only 3% bought some! That’s 10x fewer buyers compared to the first test even though the choice was 4times greater! It seems a bit strange, doesn’t it? It seems that if you have more choices to choose from, you should be able to select the most suitable product that best fits your needs. In fact, it’s not the case. It actually just gets more difficult for people to make a decision to buy. When we have more choices, we expect more. This is because we expect that we’ll be able to choose the exact item that meets our needs perfectly. 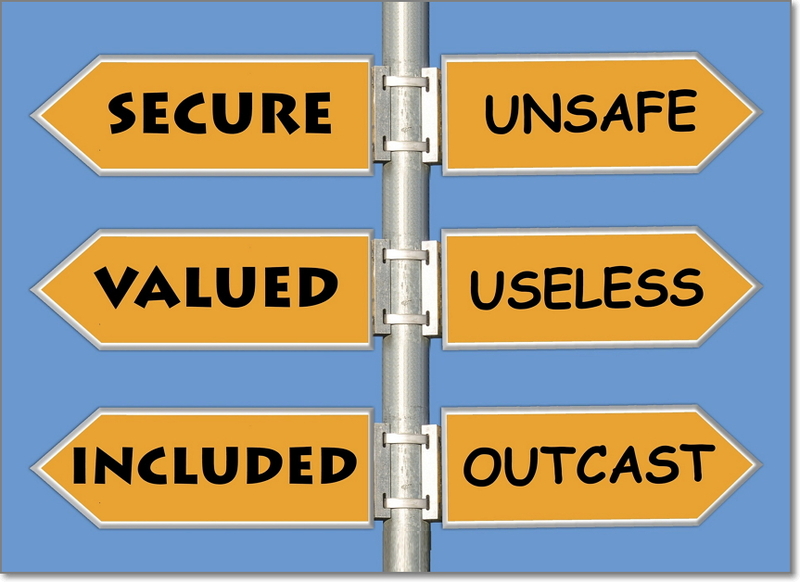 …when more choices are given for a product, the chances of our dissatisfaction with the product is higher. This is because our expectations to find the perfect product are increasing. Meanwhile, when no choice is offered, we either have no expectations or our expectations are lowered. Consumers become paralyzed and don’t choose at all. Don’t offer too many choices on your page. Only present 3 to 6 products at a time. Head over to practically any store around and you’ll see prices that end in “9” everywhere. Sometimes it gets really confusing. But that’s probably one of the most popular tactics that marketers are using to trick the human brain and make the product look “cheaper”. Let’s investigate how this little trick is affecting consumer’s buying behavior. The University of Chicago decided to carry out an experiment with price variations. In their experiment, a mail order catalog was printed in 3 different versions and sent to an identically number of people. A standard woman’s clothing item was tested at the prices of $34, $39, and $44. To the researchers surprise, in all tests, the item with number 9 at their ending price got the most sales. Even when the items were priced at $39, it got more sales than the same item priced at $34. But that’s not the only study with 9 price ending. 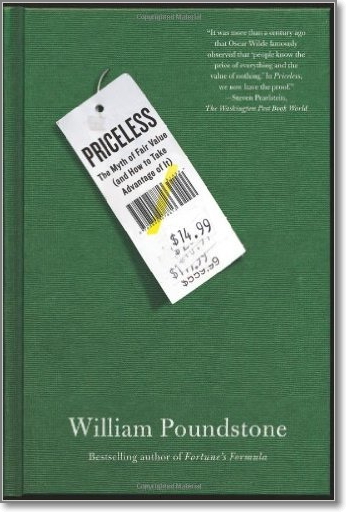 William Poundstone also analyzed 8 different studies in his book “Priceless: The Myth of Fair Value (and How to Take Advantage of It)” on the use of charm prices ($49, $79, $1.49 and so on). 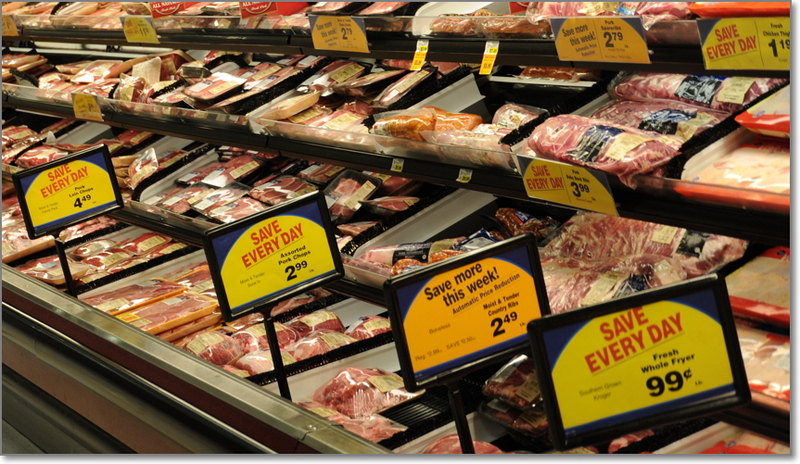 He found that, on average, prices ending with 9 increased sales by 24% versus their nearby, ’rounded’ price points. So, how to explain this magic of number 9? It seems that this number can totally mess up our understanding of real price differences. Earlier there was an article called “The Psychology of Pricing: Making Prices Tick” on the Product Management Journal (unfortunately it’s not live anymore, but I’m so happy that I’ve saved it to my notes). 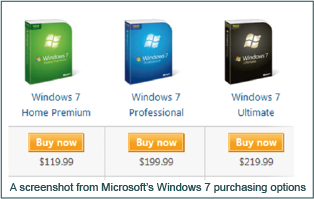 There was a pricing example provided from Microsoft’s web page selling Windows 7. It’s funny how $199.99 seems a lot less than $219.99 even though it’s only $20 difference. It’s also interesting that $119.99 and $199.99 don’t seem that far apart even though there is $80 difference. 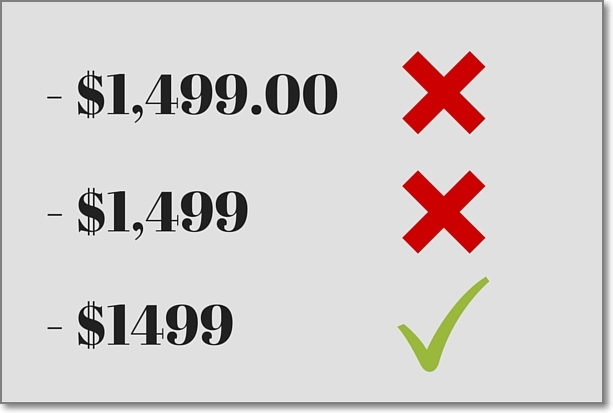 It only proves that the psychological difference between $199.99 and $219.99 looks bigger than the difference between $119.99 and $199.99 because the leftmost digit matters most. 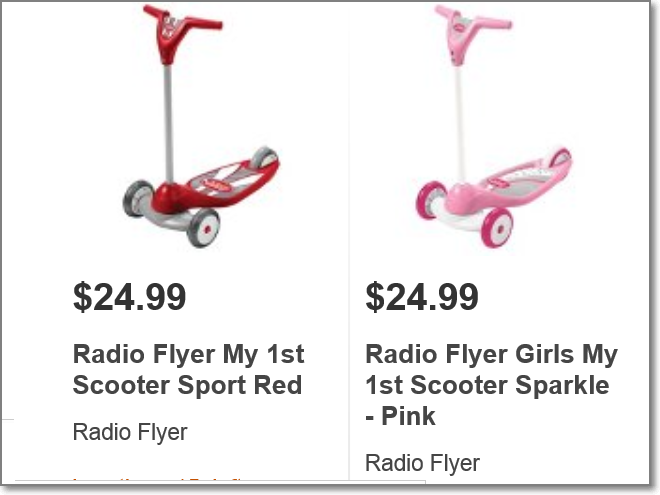 Since too many options can reduce consumer commitment, you may think that identical price points for similar items (for example, same scooters with different colors) won’t affect your overall sales. According to research from Yale University, if two similar items are priced the same, consumers are less likely to buy one than if their prices are even slightly different. Researchers asked participants to choose or keep their money for two different packs of gum. One group saw both packs of gum priced at 63 cents while the other saw one gum priced at 62 cents and the other at 64. 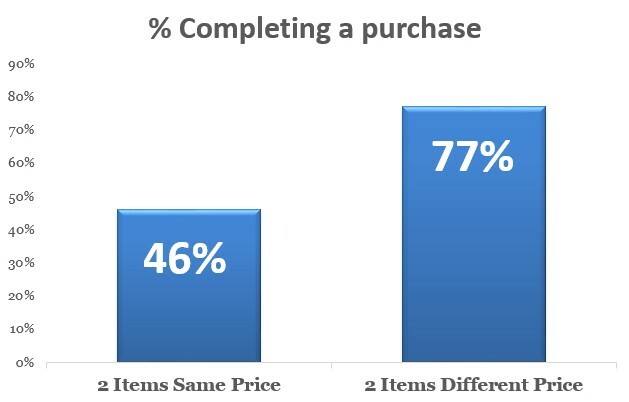 This trivial difference caused 77% of the second group to buy vs. just 46% for the first group. In other words, that’s a whopping 67% increase in total sales! It seems that when similar items have the same price, consumers are inclined to defer their decision instead of actually taking action. So when you have items that are similar but with different features, you should consider testing sales by changing their prices so that they are slightly different from one another. But there’s one more thing to note about this strategy. 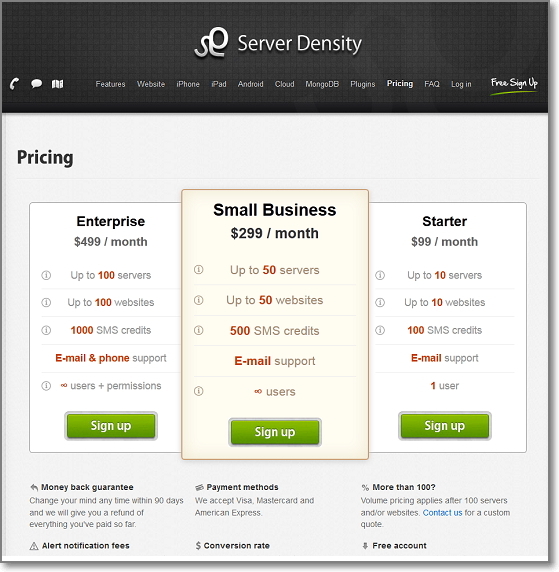 Don’t think that you can’t use similar pricing on your sales pages. Actually, you can. And it can be stunningly effective! But there’s one little secret involved. Let’s move to the next paragraph then. Did you know that you can raise the value of a single product without touching its price by placing another less valuable product next to it at the same price? Dan Ariely, in his book “Predictably Irrational” provided an example where the introduction of a third variant suddenly made one of the earlier variants look much better. 16% chose web subscription and 84% print & web subscription. Nobody chose the middle option. Then he removed the middle option and gave this offer to another 100 MIT students. 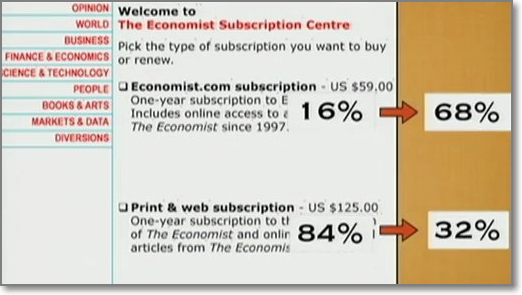 Now 68% chose web subscription and 32% print & web subscription. 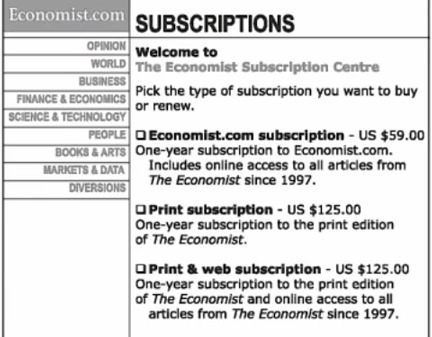 Did you notice that in the first experiment, print & web subscription was the most popular option, meanwhile in the second one the lowest price won? The point is that the middle option wasn’t useless, but it helped people to make a decision. That’s because people have difficulty comparing different options. But if two of them are very similar (for example, same price), then it becomes much easier to decide which is more valuable. 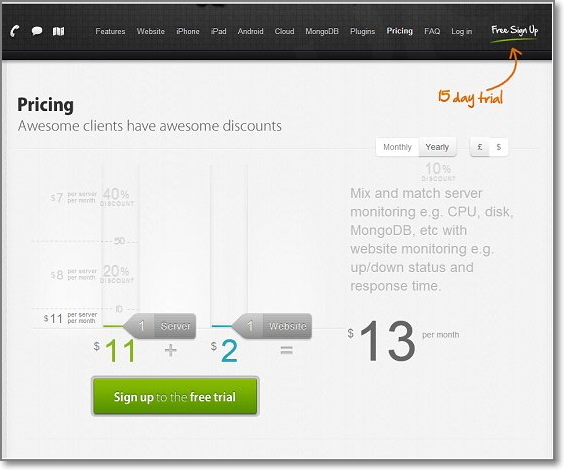 Based on the same model Unbounce also did a similar experiment with their pricing page. Then they came up with a hypothesis that this is a page most consumers are too familiar with, because from their stand point, it’s hard to see the real value. 233% increase in TOTAL conversions. 86% purchased the yearly plan of $299 and only 14% opted for a monthly plan. And how you can use it? First, give your users a product with only core features. Then create another product with all your features. This is the product you WANT to sell. Finally, create a third product which has the same or similar features as your first product and price it the same as your second product. Imagine if you could make one simple tweak to your pricing page and see an instant boost in your online sales for a high-value product. Think it’s near to impossible? There’s a proven solution confirmed by various studies which can help increase your sales even for a high priced products. 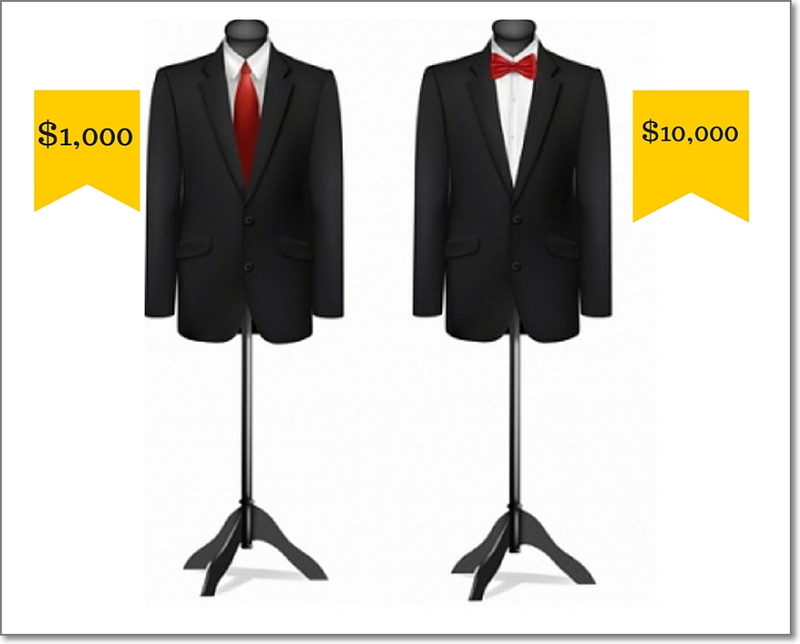 What’s the best way to sell a $1,000 suit? – Put a $10,000 suit next to it! $1,000 alone looks pretty big figure to spend on something. But next to $10,000 it suddenly becomes quite a reasonable price. This mental effect is called “price anchoring“. According to research from Rutgers University we are willing to pay higher prices when they are “anchored” by an even higher price. Mathematical psychologists Amos Tversky and Daniel Kahneman explained that if we have any uncertainty about the price of a product, we often look for information from surrounding offerings. Thus, a $1,000 suit seems like a bargain next to a much more expensive suit. 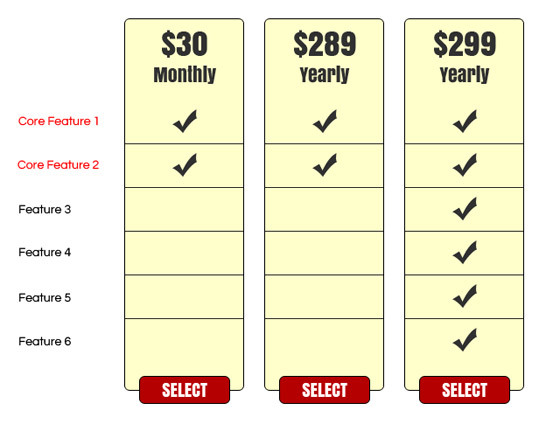 That $49/month package look like a really good deal next to the $1299 annual package. William Poundstone revealed that this strategy is also very often used in restaurants to encourage diners to buy more expensive items. By putting high-profit items next to the extremely expensive anchor, they seem cheap by comparison. 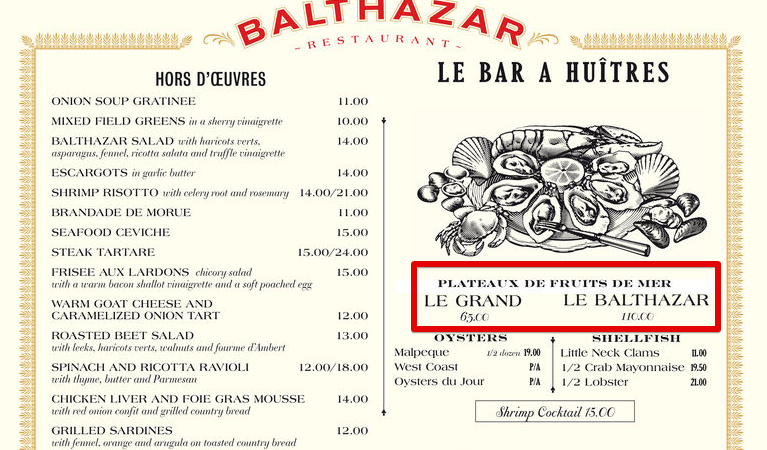 So, the triple-figure price here is probably to induce customers to go for the $65 Le Grand plate to the left of it or the more modest seafood orders below it. Add some very expensive products to the selection (that you don’t even intend to sell) next to the product you want to sell. By placing premium products near standard options you’ll be able to create a clearer sense of value for potential customers, who will view the less expensive options as a bargain in comparison. Moreover, there are always people who want a premium option. And offering an expensive option will not only allow for those interested in spending more the ability to do so, but it’s also a lot safer than introducing a cheaper option. In the Journal of Consumer Psychology, researchers found that prices which contained more syllables seemed drastically higher to consumers. …the top two prices seemed far higher to consumers than the third price. The same also happens even when the number is evaluated internally, or not spoken aloud. How about those “$” and “€” currency signs? 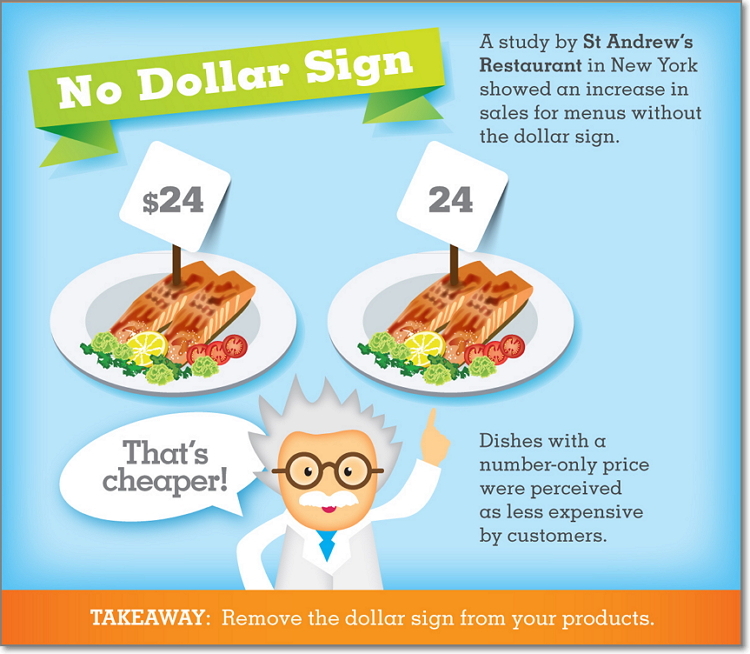 Another study by Cornell University found that diners in upscale restaurants spent significantly less when menus contained the word “dollars” or the sign “$”. 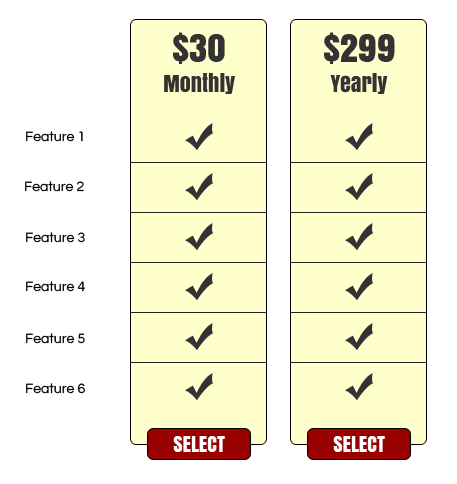 So, perhaps making your prices look more simple is just what your sales pages need? Sometimes increasing your product price can help you dramatically increase your overall revenue. And you shouldn’t be afraid of doing that. …one simple lift in your product price can help increase your total revenue by a whopping 100% and even MORE! Visual Website Optimizer shared a study, which revealed how a server monitoring company was able to increase their total revenue by 114% by raising their product prices. The increased price resulted in a decrease of 35% for free signups. …their total revenue increased by the whole 114% (or more than 2x more than it was before)! Pricing is important to get right and the best way to do that is to test your hypothesis with real data. Most of your customers care more about the value your product provides them rather than how much it costs you to operate. 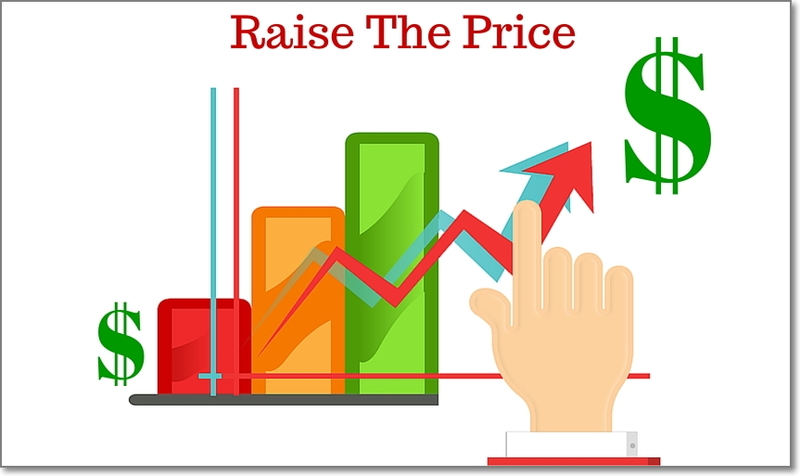 Therefore, you should base your prices on what your product is worth to your customers and not on how much it costs you or the profit you want to make per sale. Always keep testing; you don’t know where you’re leaving money on the table. By the way, many sales professionals agree that it’s much easier to sell 1 product which is worth $2000, than 200 products which are worth $10 each. That’s because it’s a lot easier to get 1 paying customer than getting 200 people to pay even a small amount. So maybe a small lift in your prices is just what you need in order to increase your overall revenue. People don’t know how much things are really worth. Thus, a possibility for buyers to pay their desired amount can work extremely well. In some cases, the buyer will choose an option to pay the lowest possible amount. But in most cases, they should choose to pay more than the product is actually worth. In this experiment, more than 113,000 amusement park visitors were offered three different ways to buy a souvenir. A first group was given a traditional fixed price, and half of this group were told that 50% of the income would go to charity. A second group was allowed to pay whatever price they wanted, including zero. And of this second group, half were told that 50% of whatever price they paid would go to charity. During this experiment, researchers found that at a standard, fixed-price, the charitable option increased demand only slightly. However, when participants were able to pay whatever they wanted it created substantially more profit. In another experiment, creators of the indie video game “World of Goo” decided to celebrate their one year anniversary and offered their users the chance to buy the game for whatever price they want. During 13 days of the experiment, about 83,250 people downloaded the game from their website with the average price paid of $2.03. Moreover, another nice side effect of this promotion was that sales of other games Steam and WiiWare rose by 40% and 9% respectively. You probably already know that product discounts are one of the most effective marketing strategies. But have you ever thought that it can also create delays and lost sales if presented to customers in the wrong way? Once again, I have an amazing example from the article called “The Psychology of Pricing: Making Prices Tick”, which were published in Product Management Journal (and, unfortunately, it’s not available anymore). Which options do you think are more likely to stimulate customers to make a decision to buy? Well, as you probably noticed, in the first and second examples, both discounts are the same. 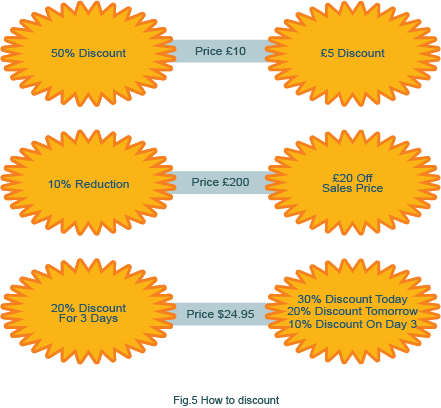 However, according to pricing psychologists, a 50% discount in the first example is more attractive than £5 discount. This is because 50 is a bigger number than 5. Meanwhile, £20 off from a £200 item seems far better than a 10% reduction. The third example is from an experiment in a retail store in the USA, reported in The Psychologist. 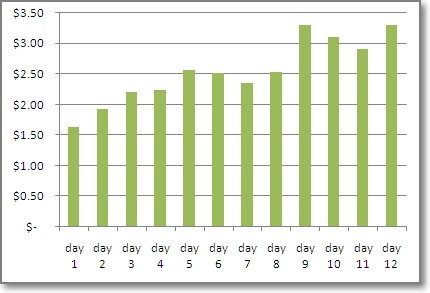 The first offer of a 20% discount for 3 days caused a 70% increase in sales. However, the second offer of a tapering discount resulted in a staggering 200% increase in sales! The rationale was that customers were keen to avoid losing out on the discount so were prompted into taking action and made an immediate decision to buy. Which option would be the most suitable for me? 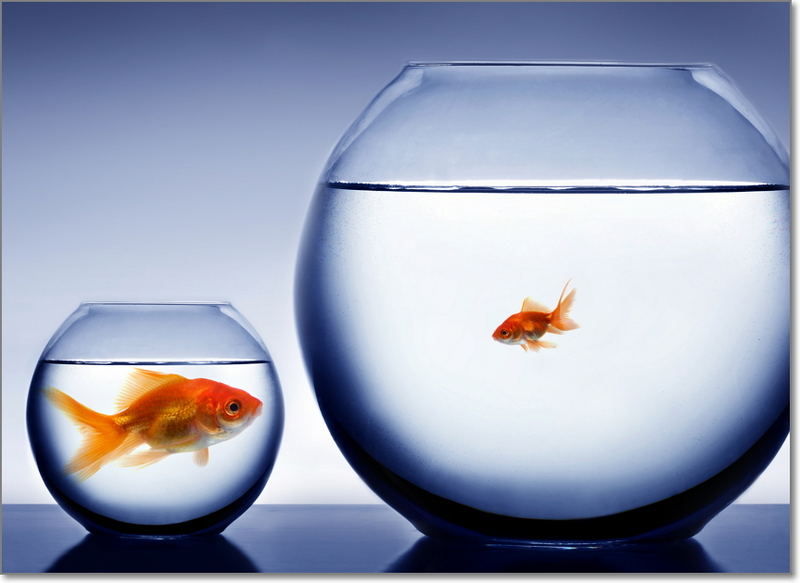 …follow the “Rule of 100”! When your price is under $100, use a percentage discount (e.g., 25% off). In both cases, you’ll be choosing the discount with the higher numeral (which will influence people’s perception of the magnitude). 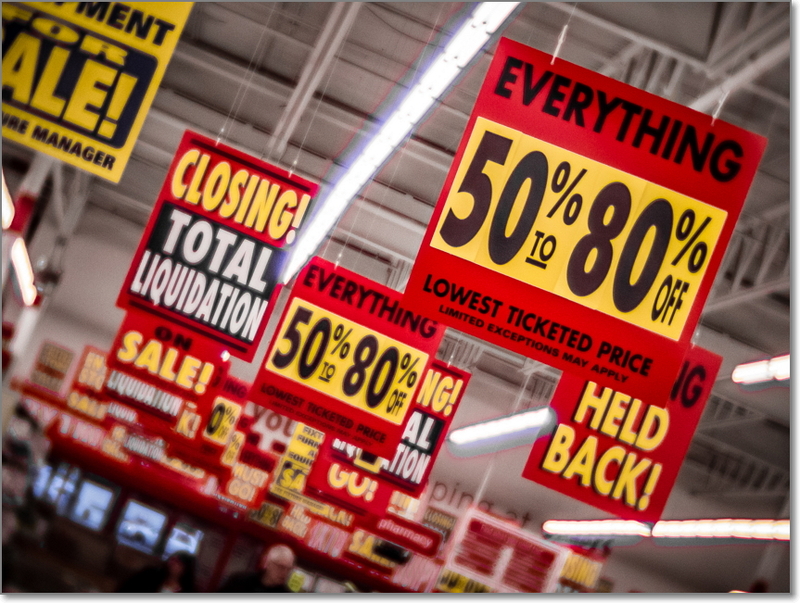 A team of researchers, led by Akshay Rao of the University of Minnesota’s Carlson School of Management, looked at consumers’ attitudes to discounting. They found that people may think that a 50 percent increase in quantity is a better deal than getting a third (33 percent) off the regular price. In this experiment, the researchers sold 73% more hand lotion when it was offered in a bonus pack than when it carried an equivalent discount. The main reason is that most people are useless at fractions. This numerical blind spot remains even when the deal clearly favours the discounted product. or 33% off the price. The discount is by far the better proposition, but the supposedly clever students viewed them as equivalent. Some researchers postulate that it’s a result of humans’ inability to understand basic fractions – and this is probably a large factor. Don’t talk up the discount. Talk how much bigger the box is or how much additional value they’re able to get. Probably, we all are familiar with the free shipping offers. Ten years ago it was a very effective way to increase online sales. But today we’re barely buying anything if we’re not getting a free shipping together. So, if you want to come up with with something new and outstanding then offer a FREE product and ask your visitors to cover only the shipping costs? This is a very successful sales strategy that Russell Brunson is using when selling online. What he does is that he’s giving away a free product and asking only to cover shipping costs (see here how it looks like in action). If you aren’t familiar with how the offer works, you may be confused about how people make a profit when they are sending a product for free. But that’s only the first impression. While there isn’t much margin when you offer the product for free plus shipping, you can offer some outstanding upsells that encourage people to buy more right after they order your product. A free plus shipping funnel is basically founded on the premise that since a customer got something for free with complimentary shipping to boot, they are justified to purchase something else since they got something for free! Instead of selling ONE item to your visitors, you identify people that are BUYERS and thus present them with immediate upsells and/or downsells to maximize the amount of income you can generate from them. You should take your customer towards your highest perceived services or products step-by-step by providing great amount of value. Let’s take a Dentist where he offers a FREE teeth cleaning that would attract his dream client. Second he offers additional value by offering Retainers. Third he offers Cosmetic Surgery. 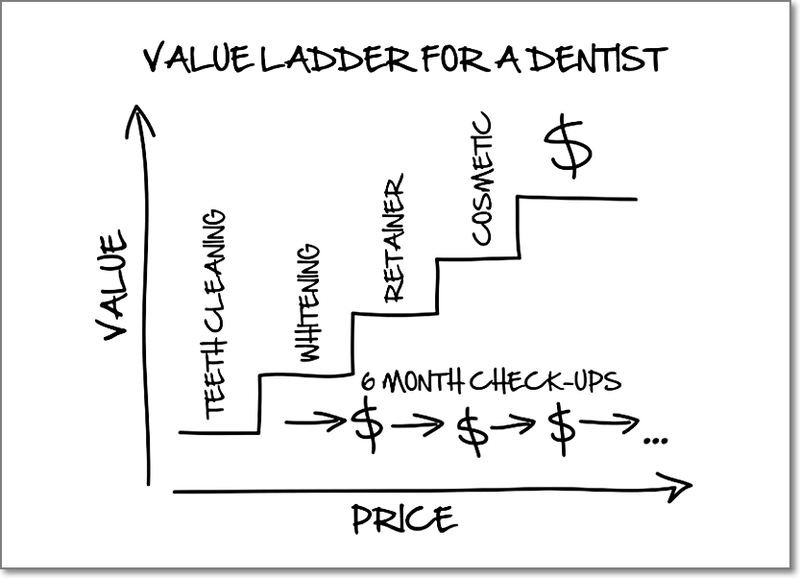 As you know, for many dentists, they make the most money and provide the most value for their patients by offering cosmetic surgery. Fourth, he offers you six months check up program which is actually a continuity program. A continuity program is where you continue paying on a weekly, monthly or yearly basis until you decide to cancel. Provide value to each customer at the unique level of service that he or she can afford. Make money and be profitable while identifying your dream clients who can afford your highest offer. and most importantly – serve more people. I just suggest you to ship the DotCom Secrets book and you will not only see it in action but will be able to learn everything while reading the book. The ability to shop from home and on multiple sites at once enables an opportunity for users to take more time before making a purchase decision. As a seller, your main goal is to prevent potential customers from checking deals on other sites and accept your offer as fast as possible. Thus, urgency sense may appear as a great strategy to increase your overall sales. 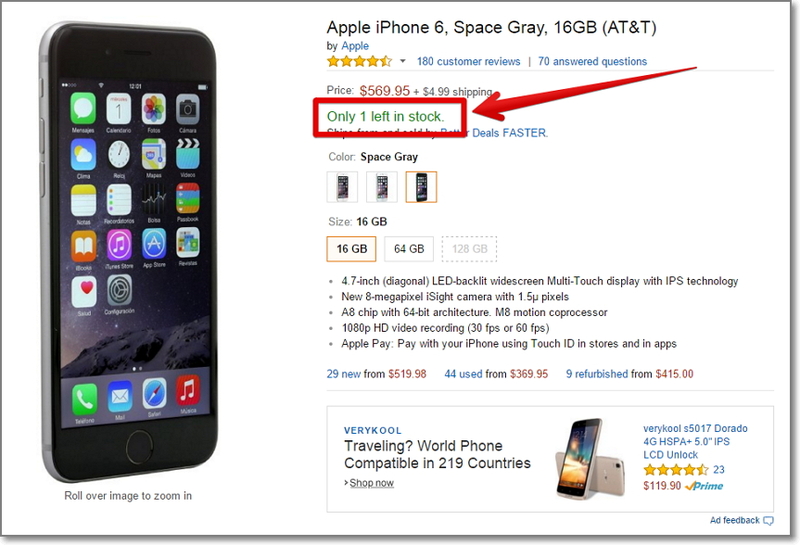 How are the world’s biggest brands are using urgency in their online sales strategy? 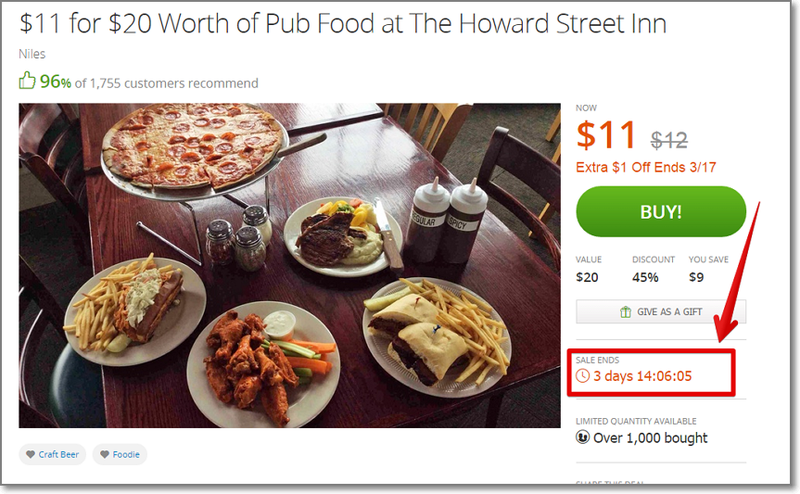 Groupon is probably the best example of implementing a sense of urgency with regular deals. They offer huge discounts on various products, but the countdown timer silently warns you not to delay if you don’t want to miss this great offer. They regularly come up with brilliant discount offers, but they are always time-sensitive. 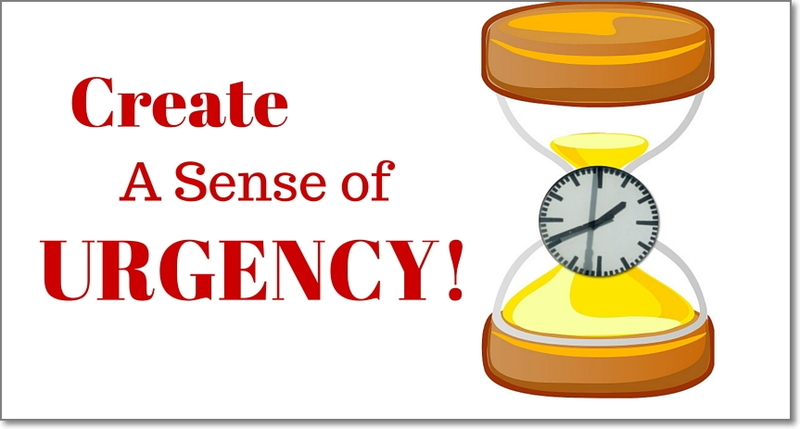 However, a countdown timer isn’t the only urgency example you can use. Some marketing experts even argue that showing limited items works much better than a countdown timer. This message tells users that this item won’t be available for long due the popularity and limited stock. Therefore, it provokes people to act more quickly. They actually show you the number of other people looking at the same route. Knowing the fact that low-priced flight tickets are usually very limited, you may start to think: “Wow, so many people are looking at this offer right now. I’ll have to hurry up if I want to get the best deal“. And you just don’t have time to think about it too much. You’d probably buy it while others haven’t even purchased it yet. Buyers do what their instincts tell them to do — to act immediately on what is important, and to acquire what is limited. Therefore, people tend to act quickly when an issue is important enough. They tend not to delay the decision to buy when they feel that they can miss an opportunity to get the exact product. And the fascinating thing about urgency is that when something begins to run low, people’s desire for it tends to rise. This feeling compels users to take action. From the customers perspective, shopping online is a bit more complicated than shopping in an offline store. When shopping offline, customers are able to take a look at the product before spending their money. Meanwhile, when shopping online, they have to pay before they get the product. Another important thing about shopping offline is that when customers have any questions or concerns about the product, they can immediately get help from shop assistants. While online shopping usually doesn’t give such opportunities. According to Econsultancy 83% of online shoppers need support to complete a purchase. This is a particular issue for ‘dependent’ shoppers, those with limited experience of online shopping, where this number increases to 90%. They also expect to receive support quickly. 71% expect some assistance within five minutes. And if they don’t get it, 48% will abandon the site. Getting the issue resolved quickly is the most important thing for online shoppers. Therefore, having a live support feature on your website may be one of the most influential factors for higher sales. It helps to add a human factor to your website and effectively assigns your customer service agents to provide real-time answers and build confidence during a customer’s shopping experience. 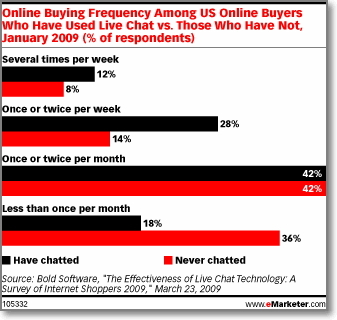 According to the study on eMarketer, online buyers who had used live chat were more likely to make online purchases at least once a week (40%) than buyers who had never chatted (22%). Moreover, 63% of respondents who chatted said they were more likely to return to the site, and 62% reported being more likely to purchase from the site again. 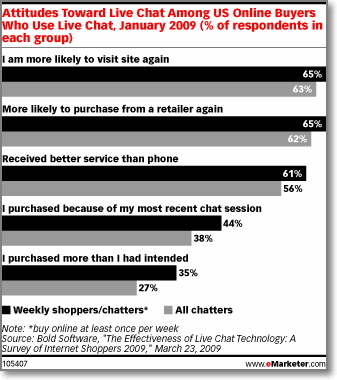 A further 38% of respondents said they had made their purchase because of the chat session itself. Logical Position implemented live chat to their website to offer immediate help for clients who were looking at their site. This feature alone helped them to increase leads by 150%, meanwhile, sales went up by a 30-40% margin (far more than they initially expected). 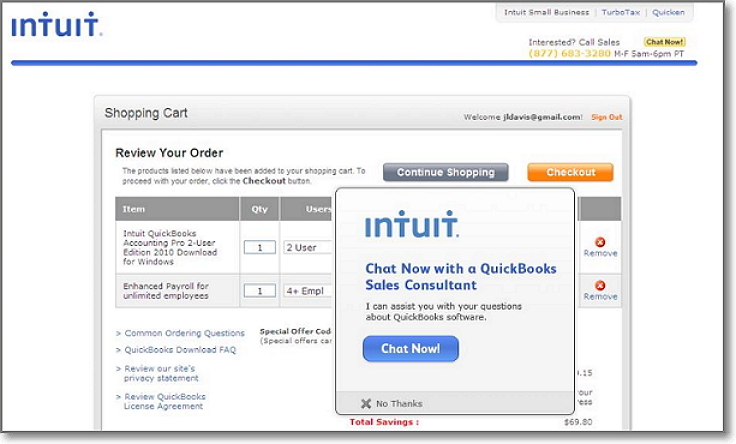 Another example comes from Intuit, accounting software providers. They successfully increased conversion rates by up to 211% using proactive chat at different parts of their site with different chat design in those areas. Using proactive chat on the checkout page increased their average order value by 43% compared to when chat wasn’t used, and there was a 20% increase in conversion rate when proactive chat was used. Meanwhile, lead page conversions increased by 190%. 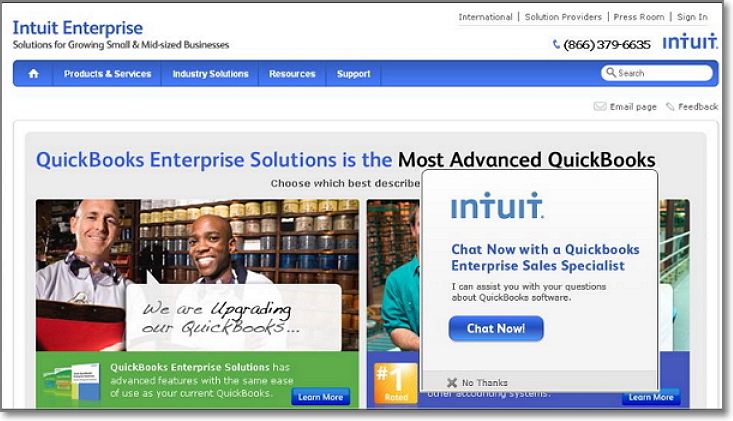 Test live chat feature on your website. There is enough evidence to show that using live chat effectively results in both increased conversion rates and higher order values. Even if you are not able to increase conversions, you’ll still have the opportunity to talk to your visitors, find out what exactly they’re confused about and what their main objections preventing them from buying your products or services are. First of all, think about how you’d look for support whenever a questions pops up about a product or service. You find yourself looking on the website for contact details or support articles, taking away precious time and you often don’t even find the answer there. 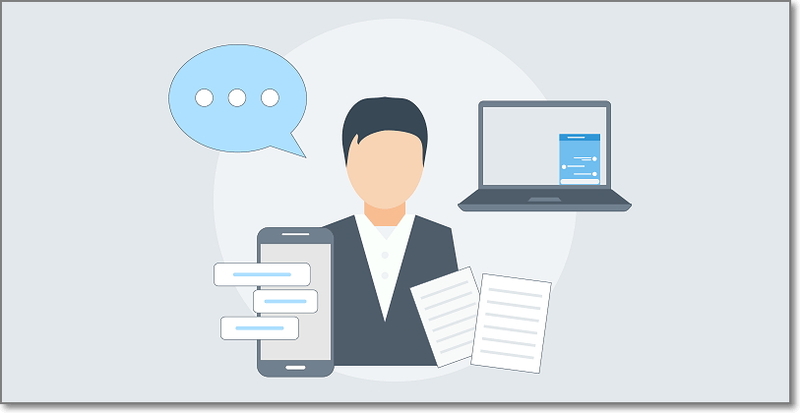 Live chat is convenient for customers, it taps into customer pain points, it lets them to feel a stronger connection with your company. As a conversion-orientated marketer, your main focus is to convince visitors to take a specific action on your landing page (typically to make a sale). Once that happens, many marketers simply thank the customer and happily walk away with cash in hand. Scientists have found that very often right after the purchase customers may begin to feel a form of cognitive dissonance called buyer’s remorse. Buyer’s remorse is when we feel regretting the cost of what we’ve just bought. It may stem from fear of making the wrong choice, guilt over extravagance, or a suspicion of having been overly influenced by the seller. However, for years, marketers have been attempting to reduce buyer’s remorse through many different methods. One specific technique employed by marketers was the inclusion of a coupon towards a future purchase at the point of sale. First, the consumer is more likely to return to the store with the coupon, which will result in a higher percentage of repeat customers. But most importantly, each successive time a purchase is made and is deemed satisfactory, buyer’s remorse is less likely to be experienced (as per the Journal of Global Business Issues). However, these days, marketers have developed much more sophisticated ways that can help you engage your customers right after the purchase and increase their satisfaction. When customers reach your Thank-You page, it’s the exact moment when a nice surprise will fire up their endorphins and make them feel happy again. So don’t waste this moment with a simple “Thanks for buying! See you later” page. Give your customers something valuable in exchange for something equally valuable to you. Right after the purchase it’s the time when customers tend to be most engaged and receptive to your brand. And this is a wonderful moment to go the extra mile and ask or offer something more to your customers. You can ask for a social share in exchange for a discount coupon; or give them a free gift for referring other people to your sales page. Everything can work incredibly well if implemented wisely. Would like to see some real-life examples? 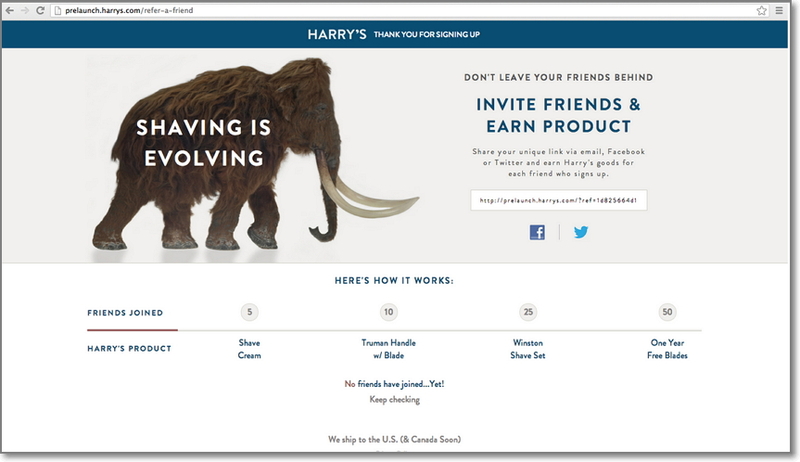 One of the most incredible post conversion marketing examples I’ve ever seen is Harry’s viral marketing campaign. With one little trick on their Thank-You page they were able to gather 100,000 emails in only one WEEK! After a user signed up to their email list they got the Thank-You page, which contained a shareable link to the email registration page. By sharing the link, users had the opportunity to earn various free products. 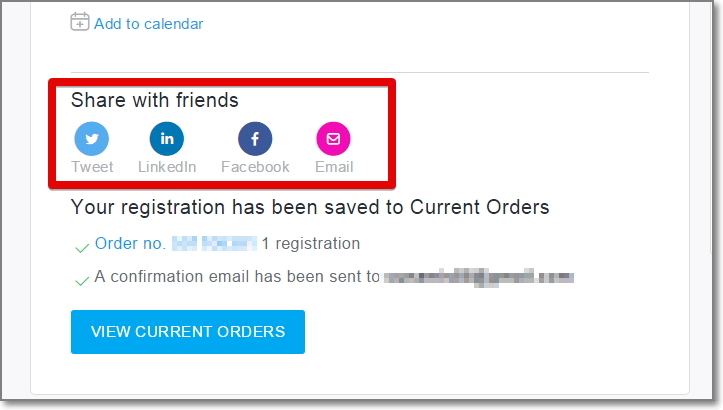 The more friends signed up using their unique referral link, the bigger the prize they earned. 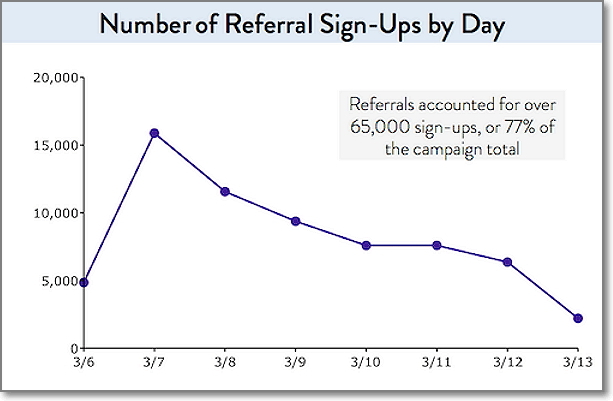 77% of the emails were collected via referral, meaning about 20K people referred about 65K friends! What they did is change their webinar registration Thank-You page from asking for a social share to asking people to subscribe to their blog newsletter. 2,500 people registered for the webinar, and of those, 40% subscribed to the blog! 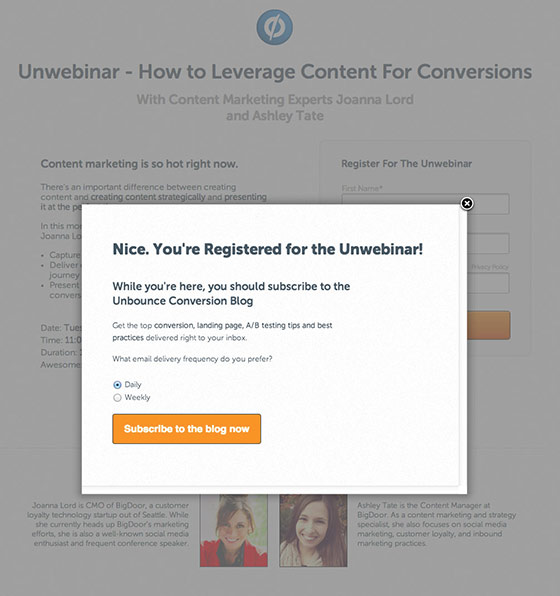 That’s 1,100 extra blog subscribers (which they have an opportunity to bring back later) just by adding a CTA to the confirmation page of a webinar lead generation form. From here, it’s all about experimentation. 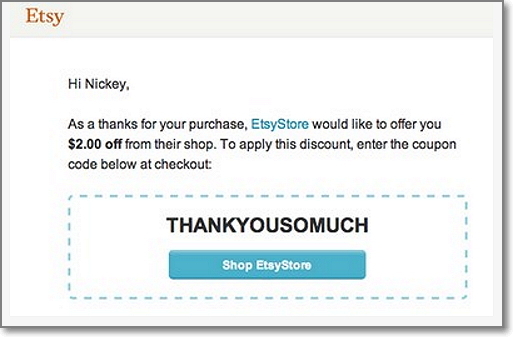 Take a few moments to evaluate your own thank-you pages. Experiment with upsells, live demo signups, quizzes, social recommendations and everything else that comes to your mind. If you find what works the best with your customers, you’ll enjoy the extra benefits, which probably wouldn’t have occurred without these tricks. 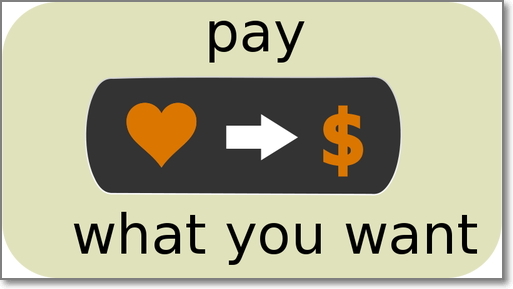 Social commerce is one of the possible choices for post-conversion marketing. But since it’s so effective, I think it should be described in a bit more detail. Are you more likely to buy a new book because the shop selling it claims it’s good or because a trusted friend says it’s worth reading? Of course, you’re going to trust your friend’s advice. A study by Econsultancy confirmed that conversations with friends and family are the most trusted source of information for consumers. And according to eMarketer, 68% of U.S. social media users ages 18-34 and 53% of those ages 35-44 say they are at least somewhat likely to make a purchase based on a friend’s social media updates. How do you convert customers into your brand evangelists on social media? As a brand, you can facilitate more sharing by making it as easy as possible for your customers to talk about you on social media. And the easiest way to start is your thank-you page confirming their online purchase. Include a couple of sentences on your thank-you page with customized social sharing icons that include pre-populated text mentioning the purchased product. The easier you make it to share, the more likely people are to follow through. When a visitor books tickets using Eventbrite for an upcoming concert or conference, the website automatically prompts the customer to share that they’ve purchased event tickets on Facebook. This wasn’t required for a visitor, but often these tickets were to see for an entertainment show, which is typically what someone is interested in sharing with their friends on social media. 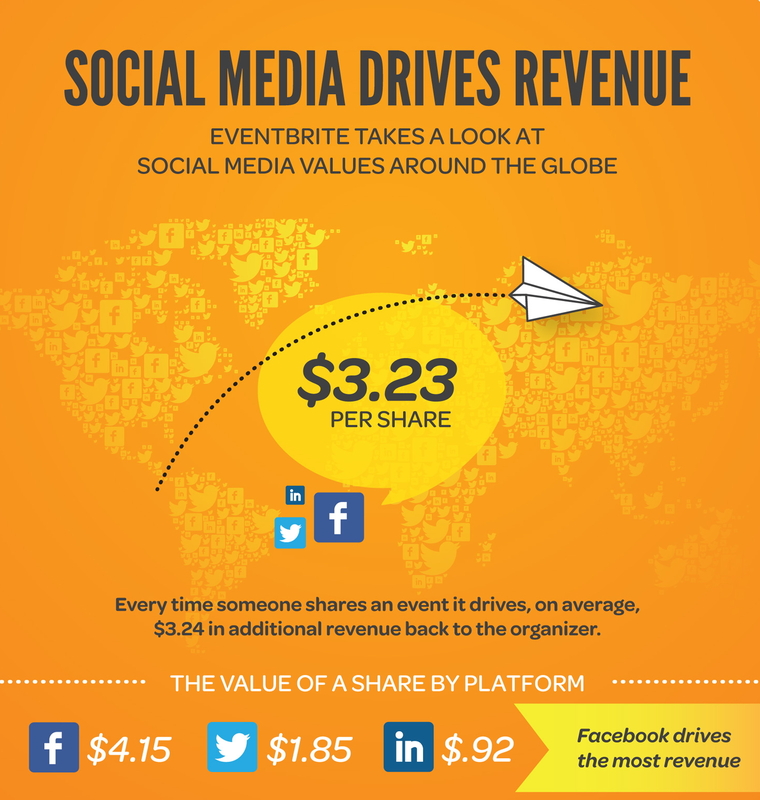 The company revealed that every time someone shared a paid event on social media, it drove an additional $3.23 in revenue back to the event organizer, and 17 additional page views back to event pages. They also found that people coming from social recommendations had a deeper engagement and generated higher sales. Moreover, for Eventbrite, Facebook became the #1 referring site for traffic to their website surpassing even the Google search engine. Marcus Taylor shared some stats from another experiment on YouMoz Blog when they ran a Groupon deal for musicians where they bundled hundreds of dollars worth of recording time, information products and discounts into bundles that sold for 1/10th of the value. After a customer bought the deal, they offered them the chance to share the deal with their friends in return for an extra $100 worth of free discounts. It increased the social proof of their landing page, which resulted in an increased conversion rate from around 5.6% to 8.3%. It also generated more customers. Over the five days the deal ran, they generated 34 sales attributed to customers sharing the deal on Facebook, which directly generated about $2,300 in extra revenue over the five days. You’ve just seen some of the best psychological techniques that can help you sell more online. Now it’s your turn to put these tricks into practice. I have no doubt that some of them will bring you incredible results. By they way, if you have anything else to add from your own experience or know a great case study, be sure to share it in the comments below.